Source: Mrs. Boyle; published in English Dance & Song, June, July 1938, Volume II, Number 6. The music suggested is "Merrily Danced the Quaker's Wife". This is a jig, not a reel. The dance does not include a reel or hey. So why is this in an article entitled "English Reels"? What do they mean by "reel"? Sadly I haven't found any responses to the request in this article for more information. North Country Ladies' Chain: Important: The man does NOT turn at all. Ladies pull by right and offer left to the man. The man steps to the right and raises his left hand; the lady backs under it to end facing the same way as the man, slightly behind him, on his left. The man lowers his left hand and steps to his left, passing the lady's left hand from his left hand to his right hand behind his back. As he does this the lady steps to her right and forward to stand beside him. They end up as a couple with the man on the left, lady on the right. Again: The music suggested is "Merrily Danced the Quaker's Wife". This is a jig, not a reel. The dance does not include a reel or hey. 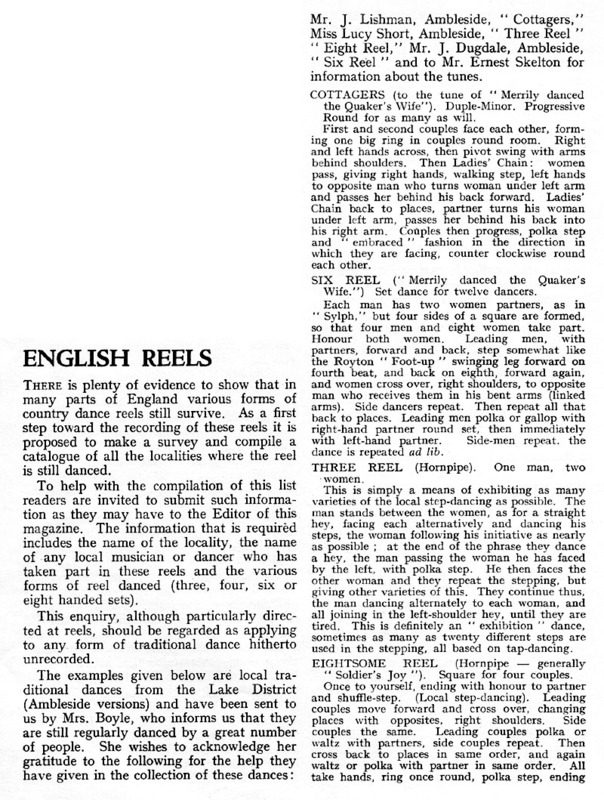 So why is it called "Six Reel" and why is it in an article entitled "English Reels"? What do they mean by "reel"? Lots of opportunities for fancy footwork, especially for the men as the ladies cross, and for the ladies when they are not doing the polka. There is a completely different dance with the same name in the Community Dance Manual. Formation: Three dancers in a line, a man in the middle, ladies at either end. At last a reel! At least the dance has a reel (hey) figure in it, though the suggested music is a hornpipe. Still hornpipes and reels are interchangeable to a certain degree, depending on what you mean by a hornpipe, and how you play it. Basically do some clog steps, dance a hey, repeat until exhausted. Well the suggested music, Soldier's Joy, is a reel (though described as a hornpipe), but no reels in the dance. This version has nothing in common with the well known Scottish dance of the same name. Add fancy footwork whenever possible! The length of the "Head Couples Polka" is not clear, nor whether you do it on the spot, or around each other. "Around each other" makes more sense to me, otherwise all four couples could do it at the same time. The description suggests you could waltz instead, though how you are supposed to waltz to Soldier's Joy or any other reel/hornpipe is beyond me! Though of course the band could switch between reels and waltzes as in Swedish Masquerade; then it would be the band's choice rather than the dancers'.